Captain Schettino of the Costa Concordia is off to jail to start his 16-year sentence for manslaughter. Most of the dependents of the men lost with the Stellar Daisy have accepted offers of compensation. With that, two spectacular losses of big ships, in fine weather, for no good reason, are swept safely off the news pages and under the carpet. They were just ships. They just sank. In good weather. For no good reason. Before these disasters disappear completely from our attention, let’s just take a final look. Despite the loss of life, the sinking of this very large ship can be counted as some sort of a success – most of the passengers and crew survived. When a similar proportion of the passengers and crew survive a plane crash, we reckon that’s a pretty good outcome. The cruise ship industry has breathed a collective sigh of relief and almost every shipowner and almost every underwriter on this planet have chipped in to the absurd costs of the removal of the wreck, to the lasting benefit of Carnival Corporation’s reputation as good global citizens, if of no-one else. The circumstances – a fine clear night with a gentle onshore breeze, and the proximity of a port – could hardly have been more favourable. Next time, things might well be different. 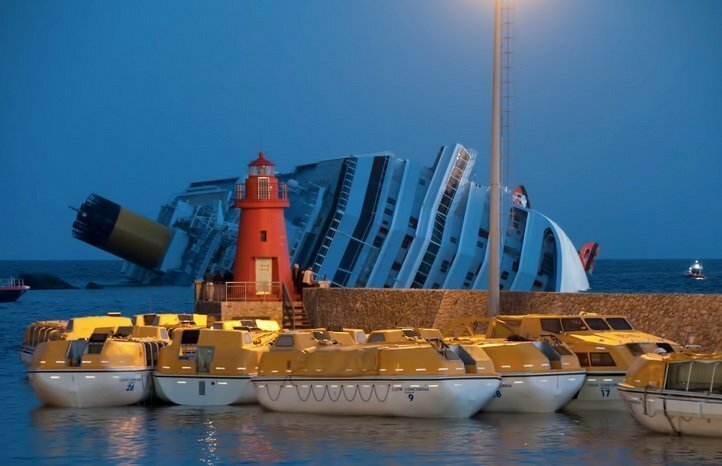 Having said that, the loss of this large modern ship on a fine clear night was a catastrophic failure of the Safety Management System of Costa Crociere. There was no bridge team management, there was no procedure for undertaking a ‘fly-by’ (OK, ‘a deviation from the most direct track for the purposes of sight-seeing’ – all cruiseships do it). It’s not rocket science. Get the team together, look at the charts, look at the tides, think of the wind and the visibility, work out the safe route, lay down a parallel index, have a series of ‘escapes’ plotted for use in the event of something going wrong, talk to the engine room, brief the team and make sure they all know what the plan is, how it will be executed and what their roles are. None of this happened aboard the Costa Concordia. The ship sank, lives were lost – and Costa Crociere, who should have been held up to blistering ridicule and contempt, having failed to establish a safe system for doing so by way of the Safety Management System that the IMO requires of them, were let off the hook for a payment of a derisory – a contemptible – million dollars. This is a disgrace. It is a disgrace to Costa Crociere, a disgrace to Carnival Corporation, a disgrace to the regulatory bodies charged with vetting Costa’s SMS DOC, a disgrace to the Italian legal system, a disgrace to EMSA, a disgrace to the IMO, and above all a disgrace to many well-paid men, and a few women, in all those bodies, who are sleeping at home in their comfortable beds, when many more of them should be in jail with Captain Schettino. Our industry failed –it failed very badly – and the response has been to pass the buck and try, all too successfully, to hide from the unpleasant consequences, but the truth is that Costa, their parent company, Carnival, their regulators and their insurers have all been very, very lucky – saved by the kindness of the weather from the consequences of their incompetence. The elephant in the room, here, is the reputation of Carnival – the most profitable business in the merchant shipping industry, sitting atop what is at best an oligopoly, if not indeed a quasi-monopoly, – their reputation as litigious ‘hard men’, who have the whole system – from class societies to P&I clubs to flag states – at their beck and call. Everyone in shipping fears them – and look what they just got away with. The fact that there are fleets within the Carnival empire that are much better managed than Costa were, is not an excuse for Carnival. It is evidence that Carnival didn’t care enough. The ship sank, and people died, because her owners had a certified, ticked and bashed, Safety Management System that was not fit for purpose. And they have just got away with it. Well said Sir! Totally agree with all your remarks. Just wonder how long it will take for your article to get removed by those same people, as they did with John Guy’s book ” The Cruise”. Thank you, but credit should go to the Editors of Splash, Sam and Grant, for standing up. The well known Editor of AN Other journal, when editing a different paper to the one he edits now, once spiked a column of mine. I wish him the success in his career that he courts so assiduously, but I will neither write for the paper that he now edits, nor read it, nor quote it. i WOULD HAVE EXPECTED THAT IT WAS THE SHIPS CAPTAIN WHO SHOULD HAVE SET HIS SHIP UP TO HAVE ALL THE SYSTEMS IN PLACE. HOW DOES SOME ONE THAT INCOMPETENT GET THE CAPTAINCY OF A SHIP OF THAT SIZE ? command of a big passenger ship has been documented. There is even a Wikipedia entry which covers it. Thank you. This article should be compulsory reading for anyone who took part in the public shaming of Schettino without bothering to ask themselves why his employer was hanging him out to dry or, for example, why the coastguard’s unhelpful transcipts were released to a baying mob . Sure, he had his day in court and has been duly sentenced. No argument. I would expect no less and nor should he. You are absolutely spot on Andrew – disgraceful reflection on Costa, Carnival, EMSA, IMO , compliant and complicit regulatory bodies, with the final blow dealt by a laughable judiciary. in addition to the navigation procedures, were there any comments/observations about the safety procedures on board with particular reference to closing internal w/t doors etc., when navigating in close proximity…at night…? Andrew, I had no chance to see Costa Concordia ISM documentation. From what you say here it looks like you thoroughly reviewed it before writing this article. ISM is a tool for captain and his crew to know, use and propose improvements to it if seen helpful. In my opinion, in this case captain ignored all the safety basics and subsequently run away. Can the best ever SMS prevent it? You and I may differ in our interpretation of the ISM Code. I would say that if a ship can be lost through the actions of one man in the presence of several colleagues, then there is something very wrong with that ship’s SMS. In this case the flag state and the port state were one and the same. But I take your point. The story I was told.. was that the Capt is at dinner. There was no flyby but the ship adjusted course to go aft of another shop and never corrected it’s course back to the original heading. The duty OOW never corrected the course until the 1000m proximity alarm went off. At which point the CC made a sharp turn and it’s stern hit the rocks. The Capt was barely on the brdige when the hit occurred. Of course,i might have been informed incorrectly.. There are quite a number of versions of the AIS track of the CC on Youtube. I certainly recall one which does indeed show the CC being overtaken to port by another vessel and subsequently altering under her stern to close Giglio. There is another AIS track showing a “fly past” of Giglio by the same ship on the 14th August 2011. I certainly think it is possible that going under the stern of the overtaking vessel put the CC on a broader closing course than had been used before and one wonders if the bridge team were alert to this and if they comminiucated this to Captain Schettino when he arrived in the wheelhouse. Regardless of this – there was evidently a loss of situational awareness on the part of the bridge team and one must ask – where was the bridge team management? The Master, Chief Officer, Chief Engineer and Pilot of the ferry JOLLY NERO are all “doing time” following an accident in 2013 when the ferry hit the quay in Genoa. The owners got off with … a million Euro fine.